In this paper, we analyze the data collected through in-depth interviews of migrant workers in Southern China about their mobile cultures. 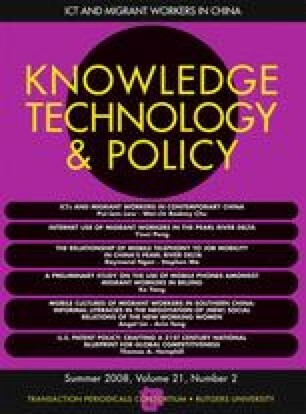 In particular, we focus on understanding the role that mobile cultures play in female workers’ negotiation of their social and romantic relations and leisure space and how these negotiations are directly or indirectly facilitated by development of informal literacies through their frequent short message service communicative practices. These will help us understand the lifestyle aspirations and life trajectories of the new young working women in China who are experiencing the most rapid socioeconomic changes in society and negotiating their ways of life amidst much tension between old and new values governing lifestyle aspirations, familial, and gender relations. The authors are indebted to Pui-lam Law, Jing Wang, Ke Yang, Xiaojing Liu, and Yinni Peng for their valuable work in collecting the interview data for this study. Special thanks also go to the anonymous reviewers for their very useful comments and suggestions.